The album begins with the excellent “Opening Title Music”, a short cue that uses all the aforementioned elements to immediately transport the listener to idyllic islands and turquoise seas. Of all the tracks featured on the album it is the songs – many of them composed as musical “set pieces” and featuring texts from a variety of languages including Maori, Hawaiian and Rapanui – that linger in the memory once the album has finished. Track 2, “Mooki Ana Low-hey”, is a beautiful piece, starting as it does almost tentatively with solo female voice before being supplemented with additional voices (including the male voices of the Joyful Company of Singers) and booming percussion. The short opening track and “Mooki Ana Low-hey” are a joyous start to the album and celebrates the natural bounty and cultural diversity of the region. This celebratory feel is reinforced throughout with tracks such as “Hey Nama Kay” and “Anuta Song”. “Anuta Song” is traditional song that features an arrangement by Mitcham and is sung by a group of children who spontaneously burst into song after they had come to see what the BBC film crew were up to on the beach. Contributions from soul singer Ola Onabulé’s rich voice for some songs (e.g., “Ho’okahi Moana Uli”) and the addition of male voices on more orchestral tracks such as “Magical Eels” and “Easter Island Majesty” adds variety and breadth to the vocal element of the score. The more instrumental portion of the score also features a variety of styles to enhance the different aspects of the life for nature and the isolated native communities that is the focus of the programmes. “Journey Through Paradise”, “Once There Was An Island” and “Turtle Journey”, with their emphasis on delicate guitars, complement the slow pace of life for many of the inhabitants and are fine examples of how the composer’s music frames the scenes. Drama does feature in the score for South Pacific and for these tracks Mitcham supplements the score with an ensemble of 8 cellos, adding something a bit more “classical” to his “musical colour palette”. The cellos heard in “Tuna Swirl” for example illustrate the speed and motion these fast-swimming fish. Percussion and brass adds further drama to the piece. Strings also add a seafaring feel to “Shipwrecked Whalers and Stranded Whales” and a sense of sadness for the story of a band of 19th century whalers stranded in their lifeboats after battling with a sperm whale. Light-hearted tracks (seemingly compulsory for natural history documentaries) are also in evidence with jaunty ukulele rhythms competing with saxophones and “slapstick” percussion (and what sounds like a very quiet muted trumpet) to supplement witty images on-screen (“Mandarin Fish Fury” and “Meet The Monopodes”, respectively). And after a score that moves between beauty, danger, sadness and comedy, the album closes with a restatement of the theme first heard in “Opening Title Music”. Interestingly, the title and credits music is an arrangement of Hawaiian musician Israel Kamakawiwo’ole’s own version of Harold Arlen’s “Somewhere Over The Rainbow” (it’s interesting to note that in the US, Arlen’s song is fully referenced in the track titles). 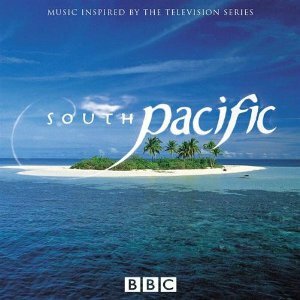 David Mitcham’s score for South Pacific is an enjoyable listen that does a good job at transporting the listener to the wonders of the South Pacific. But anyone who is expecting the orchestral grandeur of a George Fenton-penned natural history documentary score is going to be disappointed. Mitcham’s score is much more intimate and in some way his score offers more variety, using the various elements of the score in a variety of interesting combinations. This 50-minute album is currently only available as a digital download and is well worth hunting down if you are looking for sun, sea and sand for the ears. Note: I would like to thank composer David Mitcham for providing additional information on the score, particularly on the vocalists who contributed to the score. Audio samples can be found HERE and then click on blue arrow next to running time for samples of entire album or individual tracks. I really enjoy watching this Documentary by BBC Earth as well as listening the sound with stunning images about Pacific Ocean and amazing its beautiful Islands.